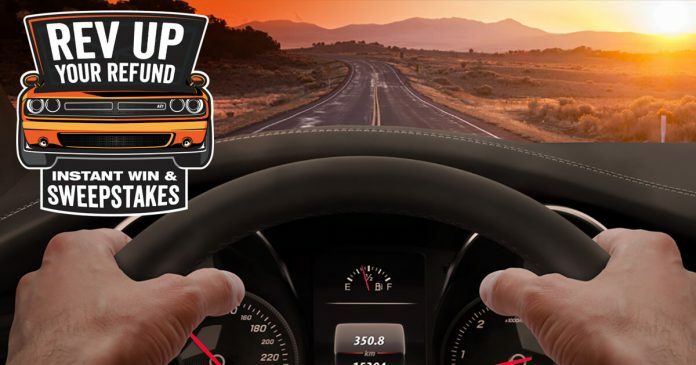 The Autozone Tax Time Sweepstakes is back to help you rev up your tax refund! Now through April 2nd, enter the Sweepstakes at AutozoneTaxTime.com and you could win the $30,000 grand prize or one of 10 $3,000 cash prizes. Plus, play the AutoZone Battery Reveal Instant Win Game for a chance to win one of 3,000 of $10 AutoZone Gift Cards. A total of $100,000 in cash and gift cards is available to be won. Don’t miss out! To participate into the Autozone Tax Time Sweepstakes 2018, visit www.AutoZonetaxtime.com and when prompted, enter your email address. If you have not previously registered, you will be directed to complete the official online registration form presented in its entirety and click the “Submit” button to be entered into the Sweepstakes drawin. Once your Sweepstakes entry is submitted you will be directed to play the AutoZone Battery Reveal Instant Win Game. Upon completing your Game Play, the results of your Game Play will be automatically displayed. If a potential Instant Win Prize winning message is revealed, you are the instant winner of an Instant Win Prize,. If you do not receive an Instant Win Prize winning message, you have not won a prize. There will be 2 Entry Periods held during the Promotion Period, each associated with a First Prize drawing. A Grand Prize drawing will be held at the conclusion of the promotion. From February 6, 2018 to March 6, 2018. From March 7, 2018 to April 2, 2018. In addition, there will be Instant Win Prizes of a $10 AutoZone gift card awarded for each Entry Period of the Promotion Period. The Instant Win Prizes will be awarded throughout each Entry Period via online Instant win. Additional prizes of a $25 AutoZone gift card will be awarded periodically in a “Fast 100” portion of the Promotion via special messaging on AutoZone’s Facebook page. One Grand Prize Winner will be selected in a random drawing from among all eligible entries received during the Promotion Period. The Grand Prize consists of $30,000 cash, awarded in the form of a check. Ten Total First Prize Winners will be selected in random drawings from among all eligible entries received by the end of each Entry Period. Each First Prize consists of $3,000 cash, awarded in the form of a check. There will be one 1,500 random, computer-generated winning times designated for each Entry Period, each corresponding to an Instant Win Prize. Each Instant Win Prize consists of a $10 AutoZone gift card. There will be 200 Fast 100 winners designated for each Entry Period, each corresponding to a Fast 100 Prize. Each Fast 100 Prize consists of a $25 AutoZone gift card. The Autozone Tax Time Sweepstakes 2018 is open to legal residents of the 50 United States, the District of Columbia, and Puerto Rico who are at least 18 years of age or older as of the date of entry. This AutoZone Sweepstakes begins at 12:00 a.m. CT on February 6, 2018 and ends at 11:59 p.m. CT on April 2, 2018. Limit of one Sweepstakes Entry and Game Play per Entrant per day. The total value of all prizes to be awarded in this Promotion is $100,000. For the names of the Grand and First Prize winners, available on or about May 15, 2018 send a self-addressed stamped envelope by June 29, 2018, to: AutoZone Rev Up Your Refund Instant Win Game and Sweepstakes Winners, 100 Marcus Drive (Dept. LB), Melville, NY 11747. Sponsored by AutoZone Parts, Inc., 123 South Front Street, Memphis, TN 38103-3607. Administrated by Don Jagoda Associates, Inc., 100 Marcus Drive, Melville, NY 11747. For more information on the Autozone Tax Time Sweepstakes 2018, including official rules, visit www.autozonetaxtime.com now!